It happens all the time — there’s seemingly nothing in the pantry to cobble together any kind of dinner. At least in the time I know I have before I pass out from hunger. Allow me to introduce you to the “emergency taco,” long a secret weapon in our restaurant kitchens. Basically, we’re folding black beans into a warm corn tortilla and garnishing the whole thing with some cheese and green salsa. 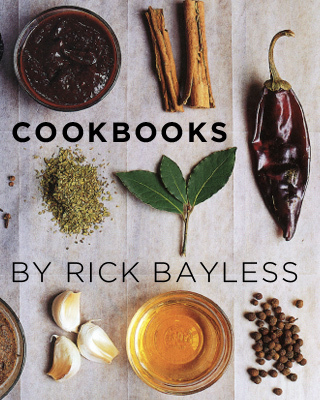 Here, I’m cooking canned black beans in rendered pork lard (that—or bacon drippings—is my preference, but vegetable oil may be yours) with a little garlic. A hit of salsa (or Mexican hot sauce if you’re in culinary dire straits) completes the meal. My “emergency salsa” go-to: raw tomatillos, hot green chile, cilantro and garlic spun in the blender for 30 seconds. If you have it, adding some avocado to the blender gives it a beautiful, creamy texture. Basic, sure, but it’s more than an elemental source of sustenance. It’s an awesomely delicious taco that’s bailed us out of countless hunger spells. I hope it does the same for your kitchen. Film the bottom of a large (3-quart) sauce pan with the lard or oil and set over medium heat. Add the garlic and cook until fragrant, about 30 seconds, then add in the black beans. Using a potato masher, mash the beans into a coarse texture and cook for 5 to 7 minutes. Meanwhile, make the avocado-tomatillo salsa. 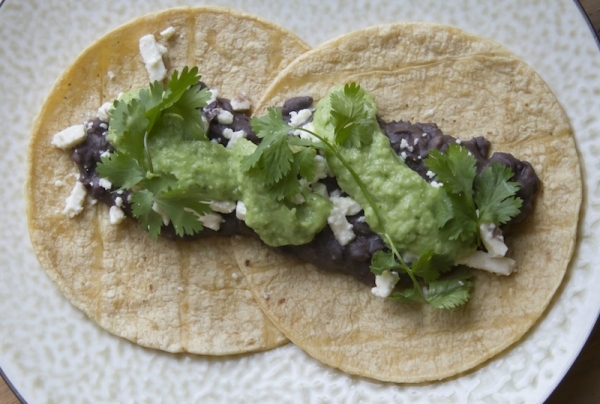 Scoop the beans into warm corn tortillas and garnish with cheese, salsa and cilantro.